The Subaru Tribeca underwent a major overhaul for 2008 with new styling, a more powerful engine, and retuned suspension, and for 2011 the updates have been kept to a minimum. 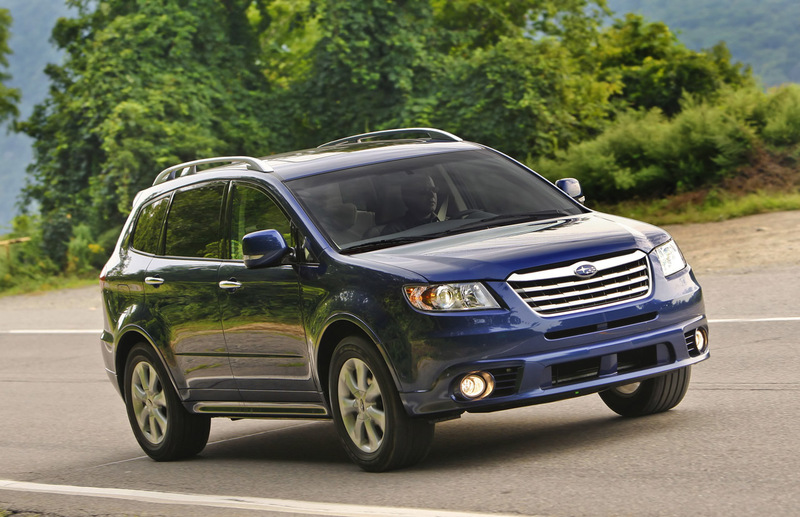 The five-passenger version of the Subaru Tribeca is no longer offered. Once again, the 2011 Subaru Tribeca's sole engine option is a 3.6-liter flat-six engine with 256 horsepower and 247 pounds-feet of torque on tap. Drive is sent to all four wheels via a five-speed automatic transmission and a symmetrical all-wheel-drive system. Performance from the flat-six engine is respectable, but it's no match for competitors like the Ford Edge or Honda Pilot. Fuel economy is neither poor nor especially good for this class, with the Subaru Tribeca returning 16 mpg in the city and 21 mpg on the highway; best of all, it runs on regular unleaded fuel rather than the previous generation's super unleaded requirement. 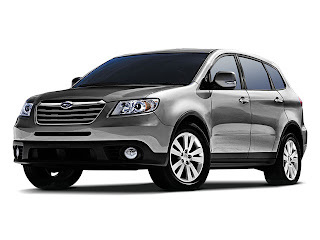 Handling is one of the best attributes of the Subaru Tribeca; push hard into a corner and the Subaru Tribeca has good body control and better steering than most other vehicles of this type. 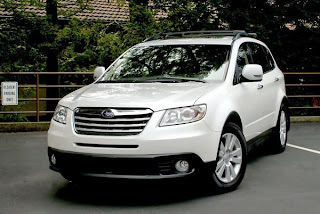 The 2011 Subaru Tribeca's 8.4 inches of ground clearance and standard all-wheel drive may scream off-road prowess, but this mid-size crossover is better suited to the suburban environment. Real off-roading isn't the goal here—just all-weather performance. The Subaru Tribeca has a firm but smooth and controlled ride, and an interior that's a step quieter than what we've become accustomed to from Subaru. Subaru Tribeca's interior has a futuristic theme with flowing lines that wrap around the driver and front passenger. The design, while unique, does limit front seat roominess, especially around the knees. 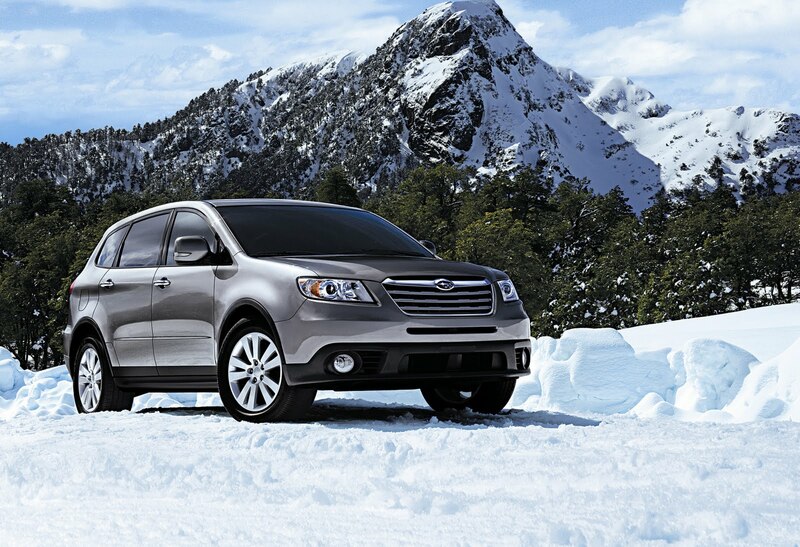 The 2011 Subaru Tribeca is also one of the safest vehicles in its class, scoring full marks in the Insurance Institute for Highway Safety's (IIHS) crash tests. On top of that, the Subaru Tribecaboasts a ton of standard safety features, including side-impact airbags for the front seats and side curtain airbags for first- and second-row passengers but not for third-row passengers. TheCarConnection.com advises opting for the rearview camera, which makes those pesky reverse parking maneuvers a breeze. A new Touring model has also joined the lineup, featuring a moonroof, a navigation system, and a reversing camera all as standard. Whichever trim you choose in the lineup—Premium, Limited, or Touring—fog lights, 18-inch wheels, power driver and passenger seat, heated front seats, and third-row seating are standard equipment.